This CD includes a 16-page booklet fill with concert images and more! 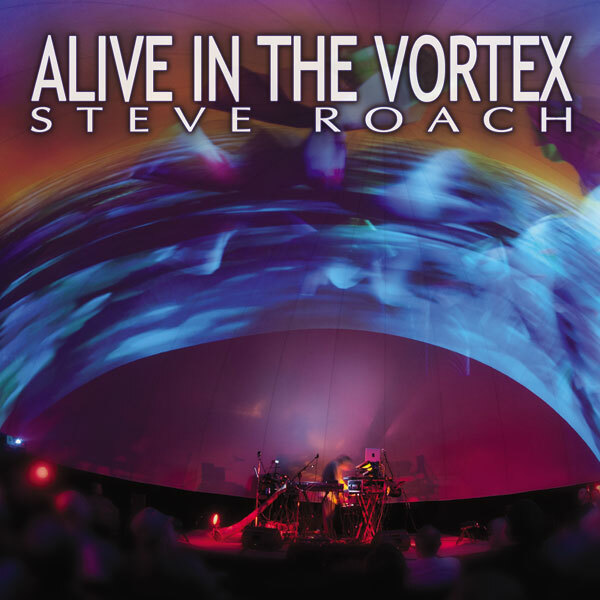 Alive in the Vortex is the complete October 26, 2013, 9pm show presented just as it was performed in the Vortex Dome with no edits, overdubs or studio enhancements. The Dome is a performance-event space located on the lot of Los Angeles Center Studios in downtown LA. The show was produced by Vortex Immersion Media, vorteximmersion.com, Ed Lantz, Kate Mccallum and Soundquest Music. In many ways this is the pinnacle moment in the soundworlds of Steve Roach. A singular expression of an artist reaching for a high plateau in his artistic vision and life’s work. This release is created live within this rarefied setting – a realm of total sonic immersion. The fortuitous alignment of everything surrounding the event combined to make Alive in the Vortex a unique moment. The audience became part of what evolved into a live-in-the-studio experience while sharing a collective aural-visual dream. The immense preparation to present this sonic journey in this perfect environment started nearly a year in advance. The first version of this set was presented at the Ambicon Festival earlier in the year, and the arc of this music reached its zenith in the Dome. After hearing the recording I felt this was the document I wanted to leave behind for someone to experience in 50 years. The extraordinary visual worlds of Audri Phillips’ live animated immersion was integral to the complete experience, wrapping us all in a womb-like expansiveness. Held in the throbbing heart of downtown Los Angeles, this marked my live concert return to LA after a seventeen-year absence. With many years living in the desert and presenting my work worldwide, the journey back to where so much started for me in the 80’s added a dimension of emotion drawn from the reflections of time’s passage. On many levels, this informed the evolution of the set throughout the night. As the final breath of sound faded back into void at the concert’s conclusion, the churning of the world outside created a dramatic return. The roar of traffic, sirens in the distance, the whirling of helicopters outside the safety of the Dome provided a surreal and poignant contrast for everyone who had been transported within the space. At this moment, we all felt a little more alive within the vortex of life.